English – Press | Katakombenpakt erinnern und erneuern! Find detailed information for press on the conference, the program, our guests HERE. Please send a short reply if you wish to attend. Soon it will be the 50th anniversary of the signing of the Catacomb Pact, in which 40 Bishops and Council Fathers of the Second Vatican Councils committed themselves to a Church of the Poor. An occasion which has been all but forgotten for some time, but whose groundbreaking character manifests itself again in view of the disputes recently initiated in the Catholic Church by Pope Frances. Following the motto „Remembering and renewing the Pact of the Catacombs“ it is the aim of a congregation of more than two-hundred Christians to bring this pact to the attention of the public once more and at the same time highlight the importance of a Church standing alongside the poor and excluded. Building on this image of the Church the congregation Remembrance and renewal of the Catacomb Pact organised by the Institute of Theology and Politics (Münster/Germany) in cooperation with project group Pro Konzil will take place from 11 to 17 November at Casa La Salle in Rome. 250 people from all over the world, from different initiatives, orders, universities, and movements will come together to engage with the processes leading to the creation of the Pact and those which have derived from it. The contributors to the gathering, which include – among others – Bishop Luigi Bettazzi (Italy), one of the last initial signees of the Pact still alive, Bishop Erwin Kräutler (Brasil), the theologian Jon Sobrino SJ (El Salvador), and the Muslim liberation theologian Kacem Gharbi (Tunisia), advocate changes in society and Church to secure a life in dignity for everybody. Together we are going to update the concerns of the Catacomb Pact for the current situation. 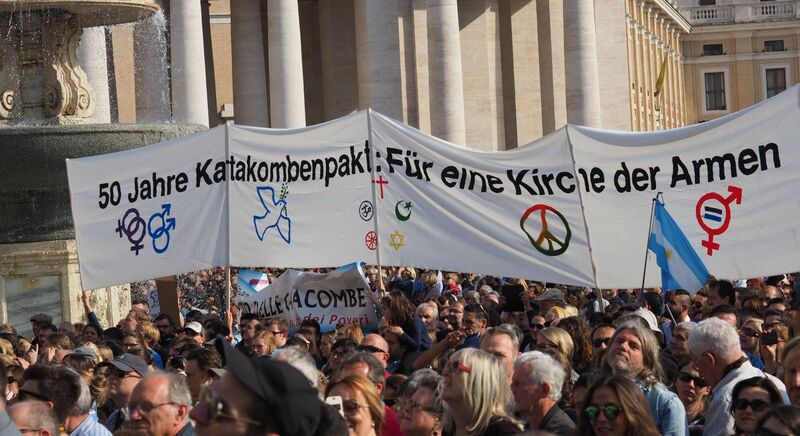 A day of study of the Justice and Peace Commissions (14 November) and the convention of the Church reform movement Council 50 (20 to 22 November) are among further initiatives in Rome remembering and drawing on the prophetic tradition of the Catacomb Pact. The universal highlight of the Pact’s commemoration will be a Church service at the historic location of its signing in the Domitilla Catacomb on 16 November. Together the initiatitives wish to take a stand in support of a Church which – just like Francis in many of his statements – has a critical view of social conditions and opposes structures that make life impossible.